In light of the upcoming Season 3 premiere of the HBO series Game of Thrones, we thought there was no better way to introduce the copyright law implications of 3D printing than with two recent examples of 3D printed objects inspired by the popular show. Loyal fans of the show will already know that the Iron Throne, the much sought after seat of power in the show, is a centerpiece of the series’ plot, as is the city of Winterfell, where much of the show takes place. Much like the imminent dangers beyond the Wall, it seems like the intellectual property questions and issues stemming from 3D printer technology are descending upon us. 3D printing is an additive technology in which 3D objects are created in overlapping thin layers. Lisa Harouni gives a great introduction on 3D printing in her TED talk. The potential capabilities of 3D printing have been discussed at length in the media. And while 3D printers now cost upwards of $1,000, as with most technology, these devices will inevitably reach a price point that opens them up to the mass market. Wired recently reported that a Game of Thrones fan, Daniel Ammann, created a 3D-printed model of Winterfell over his Christmas break by watching the opening credits of the show, which feature overhead views of the made-up city. Ammann, Executive Vice President of Research and Development at u-blox, has already enjoyed considerable online fame thanks to his innovative 3D model. With the show’s season premiere starting this weekend, Ammann says he is planning on taking on some of the show’s larger cities. So far, there have been no reports of any legal action against Ammann. Another fan of the show was not so lucky. 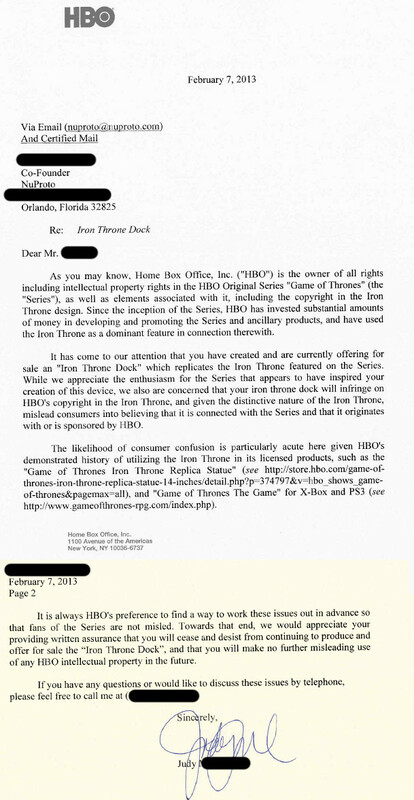 Apparently, the disclaimer didn’t appease HBO. According to Wired, the company sent a cease-and-desist letter to nuPROTO while the dock was still in pre-order. Fair enough. HBO likely pursues licensing agreements to reap commercial benefit from the show’s overwhelming popularity. But these examples provide a sneak peak of what’s to come. Copyright in the digital age has focused on the copying of music, videos, and software files over the Internet. 3D printing, however, involves two works: the digital model that was created to print the object, and the 3D printed object itself. This technology will enable the reproduction of work protected by a myriad of rights in the fields of copyright, patent, and trademark law. The implications in these separate areas of the law are too broad to review in one blog post (stay tuned for follow-up posts on this subject! ), but this is an area that intellectual property lawyers should familiarize themselves with, if they haven’t already. Sites such as Thingverse and Instructables already allow users to upload and share object files to download and 3D print. Public Knowledge, a civil society group, alluded to the intellectual property implications of 3D printing years ago in its white paper, It Will Be Awesome If They Don’t Screw It Up: 3D Printing, Intellectual Property, and the Fight over the Next Great Disruptive Technology. Just as digital copying had a profound impact on copyright law and the music and television industries, 3D printing has the potential to create both new opportunities and new threats to IP owners. How legislators, policymakers, consumers, attorneys, designers and intellectual property owners respond will be key.